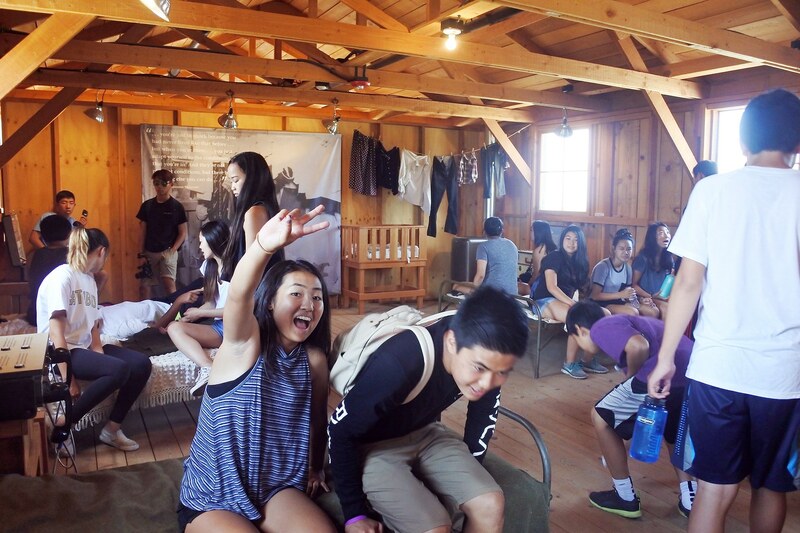 Young Japanese Americans learn important lessons on a trip to the wartime internment camp. 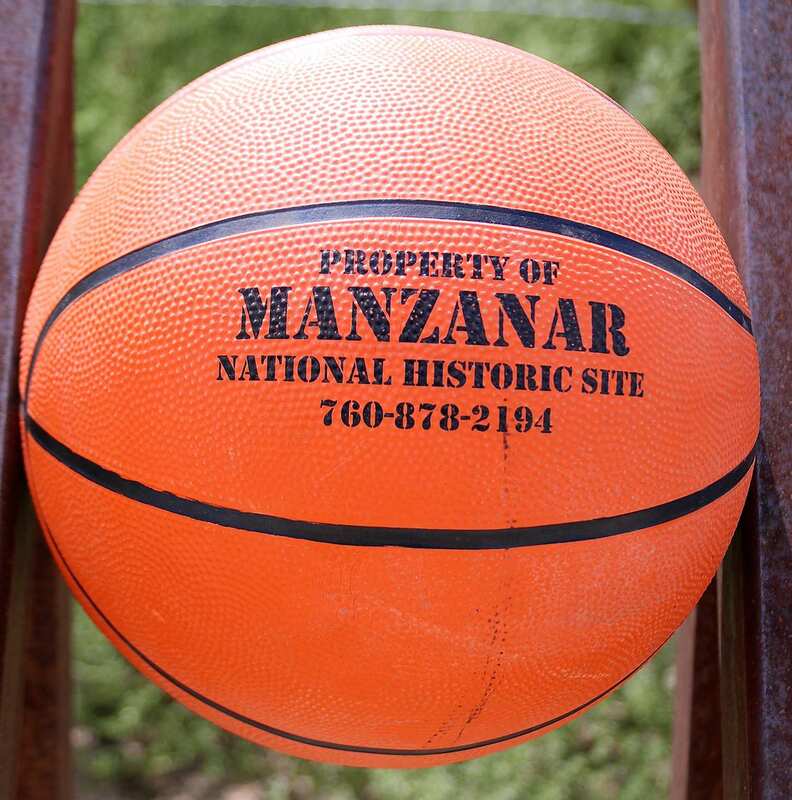 Let’s get a few kids together and play basketball at Manzanar. This inspiration came in February when my son took a field trip with the Kizuna program and played on the reconstructed basketball courts. I thought it would be a positive way to introduce the kids to the camp experience via sports. Connecting our JA kids with history has been something of a mantra I’ve used with the Terasaki Budokan project . 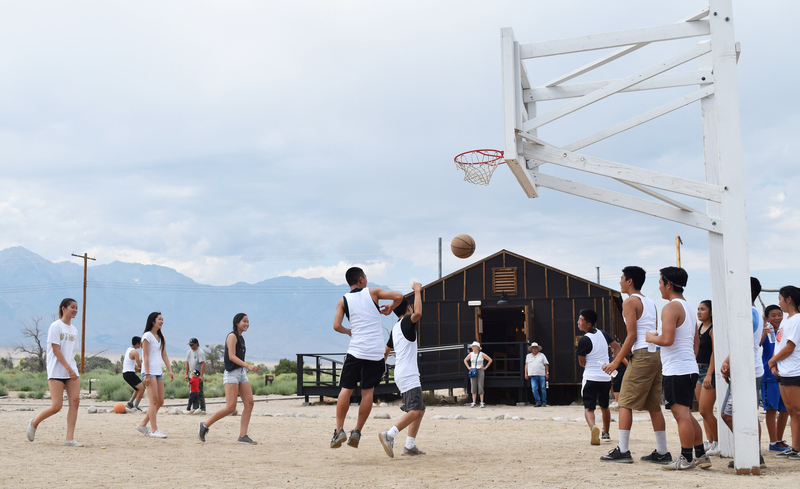 So on Labor Day weekend, 25 teens and 50 adults visited the Manzanar War Relocation Center site to honor those that suffered the injustice of incarceration after President Roosevelt signed Executive Order 9066 in 1942. Through the support of National Park Service arborist Dave Goto, we were given the opportunity to participate in a basketball game on the basketball court near Block 14. 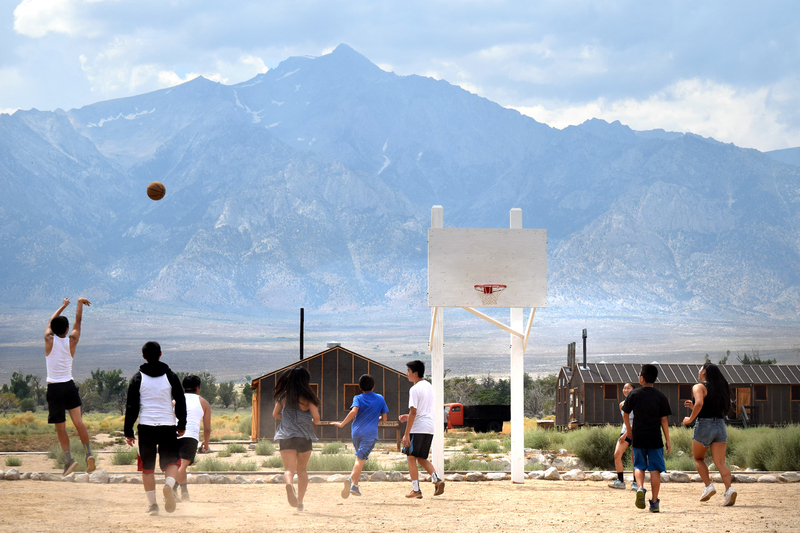 We learned that sports was a popular pastime for teens at Manzanar and gave internees a sense of camaraderie and normalcy despite the hardships of camp life. Goto, a 32-year-old Southern California native and former Orange Coast Optimist (OCO)/SEYO hoopster, gave us his Yonsei perspective into what he thought about camp. The tour began with the kids reading the executive order and then being forced to relinquish their cell phones. A subtle reminder that our government can do whatever they want, whenever they want…. even if it meant unjustly incarcerating Americans, just because they look different. Goto allowed us to enter the infamous sentry post, one of the few original structures standing, to view from inside where U.S. soldiers saw 10,000 Japanese arrive with hardly anything, and leave some three years later with nothing except for $25 and bus fare. We witnessed an archaeological dig, finding discarded items from the past… a can, a button, a shoe heel. Each linked to a story that we could only imagine. The Visitor Center afforded us a hands-on look at what the internees faced…. or more accurately, endured. The barracks showed us tangible evidence that they bore no resemblance to the homes internees left behind. We were only there for a day and paused to imagine what it was like to live like this. Did our kids realize that they lived like this for over three years? 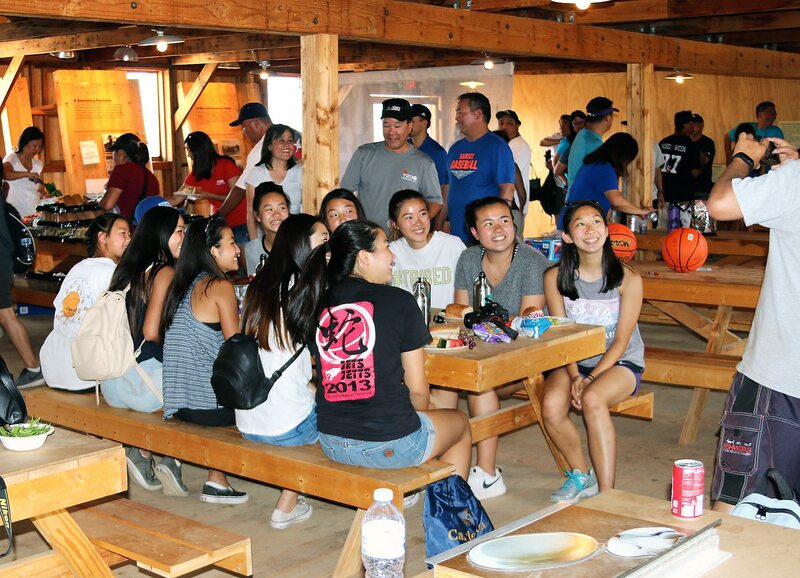 Goto gave us the opportunity to eat inside the Mess Hall. We felt the heat, noise and cramped quarters. We ate sandwiches, fresh fruit, and chocolate cookies. A far cry from the rationed vegetables and rice served daily due to wartime food shortages. Goto’s NPS counterpart noted that this was the first re-creation of a FUN TIME at Manzanar and was thrilled by the smiles and laughter she witnessed. A somber reminder that sports was a welcome distraction in camp. One wondered if the internees had water fights to stave off the heat and like us, the entire family probably joined in the fun. Our day ended at the cemetery, where the “Soul Consoling Tower” monument gave us a brief moment to reflect on those not fortunate to see outside the barbed wire. Located along the western border of the camp, the beauty of the mountains was stunning, but as you gazed back toward the camp, you couldn’t help but feel the sadness and despair. For parents and kids alike, the journey was an opportunity to share stories and find their own connection to a tragic period in American history. Angie Hirai-Yang (Clem, Danielle-Y19, Tyler-Y21, Zach-Y23): “Here’s an interesting story from my dad’s cousin. My own father was already in the Army and was actually preparing to discharge from his peacetime draft service when Pearl Harbor occurred. He eventually ended up in the Military Intelligence Service. “Interesting story: My dad was in the MIS posted at Ft. Sill in Oklahoma when he was asked to translate a letter written in Japanese to an inmate in Ft. Sill. He realized that it was written by his sister (Auntie Yone) to her husband (Uncle Juutaro), who was imprisoned for being a high-risk JA. “Of course, this was imprisonment without trial and based on his education in a Japanese military school and his friendship with the Japanese ambassador to the USA and an admiral. Otherwise, his militancy began and ended with the Koyasan Boy Scout Troop. Higashi family (Roy, Kristin, Ryan-Y21 and Kate-Y23): “This was our first visit to Manzanar and it was educational and loads of fun. Kristin’s mom was at the camp. Kate was able to locate her name on the canvas list of housed internees and also found their whole family on the archival database book. “We picked-up our dogs at Grandma’s, where Kate and Kris described what a great time we all had, and WOW!!! Kristin’s mom also knew our guide’s great uncle, who became a doctor and had his practice in Little Tokyo. Incredible to say the least. Special thanks to Dave Goto, NPS staff, Yonsei 23 families and to the many other families who participated. It was a very special weekend.